Bee Keeping in Ireland is often a personal activity, with many hives being kept on family farms and Gardens, even sometimes with the permission of the forestry services. I often come across a set of Hives while out walking in our local woodland. 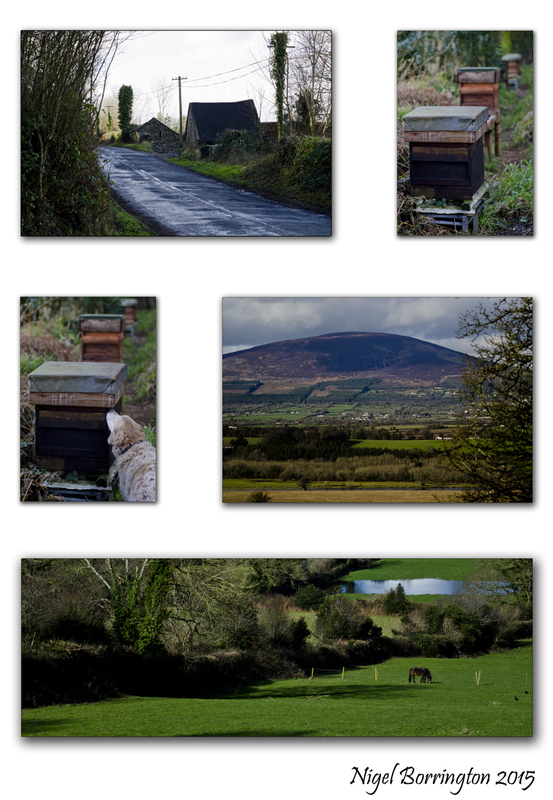 In the images here , taken last weekend the hives are located on the some hills facing to the north, the great mountain of Slievenamon just across the river Suir. Very soon these Hives will be active again and I will return to get so more images. The Federation of Irish Beekeepers’ Associations have a great web site and help on getting going with keeping bee’s, this must be a great activity and very needed with modern farming methods having massively reduced Bee numbers. I have included the text from this site on “How to become a beekeeper” below the following two images, if you would like to read it. Beginning with Bees , The urge to keep bees: How do I start? The beginner should first of all find out if he/she is in any way allergic to bee stings and if so not to attempt acquiring bees or taking up beekeeping without seeking medical advice. When the urge to keep bees first hits you, the impulse is to go out and buy a hive straight away, and learn by doing in isolation – this is not the best approach. The best first step is to join your local branch of the Beekeepers’ Association, preferably in the Autumn. You can then attend their classes for beginners and programme of winter lectures which are held frequently and cover all aspects of beekeeping. There are 45 such Associations scattered throughout the country. Other benefits of membership include the use of a library – video and book, plenty of friendly advice and you are kept up to date with developments within the craft. You can also use the Association extractor, can avail of sugar at concessionary prices and benefit from the low cost of FIBKA Public Liability Insurance. The latter is an absolute must as accidents can happen. It is worthwhile if only for your own piece of mind. Whilst a subscription to “An Beachaire” may be optional, a good book is essential and the FIBKA’s “Bees, Hives and Honey” or Ted Hooper’s “Guide to Bees and Honey” are standard references for beginners and experienced alike. Some Associations also provide a mentoring facility whereby the beginner is assigned to an experienced beekeeper within his or her local area for the purpose of giving advice for the first couple of years. This is an excellent idea as having someone close at hand or at the end of a telephone is a useful asset. If you wish to keep bees, and irrespective of all the protective measures that you might take, you will receive the occasional sting. Everyone will show some reaction to bee stings, such as the initial pain, and later a slight swelling of the affected area, later followed by some itching. The effects can be reduced by applying an antihistamine cream or even taking tablets such as Piriton, but generally the body will quickly become accustomed to the occasional sting and will display few adverse effects. There are many forms of protective clothing on the market which range from veils right through to full bee suits. And the prices are commensurate with the degree of cover. A full bee suit is the ideal acquisition but the prices are fairly steep and it may not be even to your taste. A smock, together with the type of trousers worn by nurses or painters, may be more suitable. Be wary of veils which slip over the head and are attached by straps or loops under the armpits; bees invariably find a way to gain access to your neck and face. The safest way to wear that sort of veil is in conjunction with a zip up overall. Any protective clothing should be light in colour, nothing dark. Nylon should be avoided as it generates static, which is annoying to bees. Woolly clothing should also be shunned, as they get tangled up in it. When handling bees, beginners should also use gloves. With full gauntlets they are costly but should last several years. I use rubber gloves which are less clumsy – “Nitrile” or “Marigold” brands. The ultimate objective is to obtain a strain of bee that is not overly defensive, become proficient in handling them, and so dispense with gloves altogether. Ankles are prime targets for bees and calf length rubber boots should be worn. The monthly beekeeping journal carries advertisements from firms selling all types of beekeeping equipment. The first two essential items you need to acquire are a smoker and a hive tool. Smokers come in two standard sizes, the diameters of the fireboxes being 8cms and 10cms. The smaller version is quite adequate for up to ten hives. When servicing the smoker, ensure that the legs of the fire grate are not restricting the air entry hole at the base of the firebox and also check that this hole is directly in line with the air exit hole from the bellows. As for fuel, I use dried grass which provides a constant supply of cool smoke. What you don’t want is a type of fuel which burns too quickly and turns your smoker into a flame thrower which scorches the bee’s wings. This aggravates the bees and they will not delay in letting you know of their displeasure. There are many types of hives available on the Irish market. However, in selecting a hive type it is important to determine that the component parts for the brood chambers and supers are readily available. 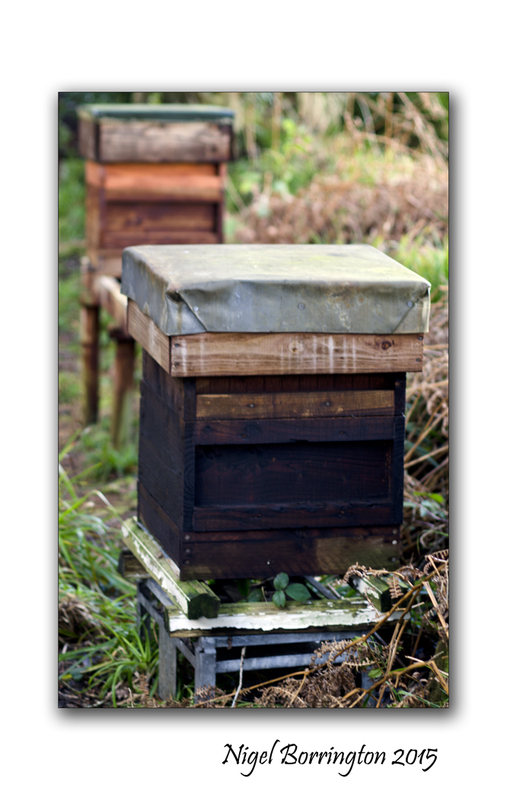 The most common type of hives used in Ireland which would measure up to these requirements are the National, the Smith Hive and the Modified Commercial Hive. The approximate comb areas of the various frames are: National and Smith Deep – 5000 worker cells Commercial Deep – 7000 worker cells. The two most popular hives are the National and the Commercial. Although the latter have larger frames, the outer dimensions of component boxes are the same, to within a quarter of an inch, so that supers, queen excluders, crown boards, floors and roofs are all compatible. The frames are easier to handle as they have longer lugs (38mm) than the Commercial (16mm). The National brood box and Super are also easier to handle as the design has a built in handle at both sides. The capacity of the National brood box and super is smaller than that of the Commercial which means it is lighter to lift when examining the hive and taking off the crop of honey. The most important advantage is the higher honey yield from the National compared to the Commercial as the National brood box is too small to accommodate brood and much stores, therefore most of the honey is stored in the supers where it can be easily taken off for extraction. This is especially true in a bad year with poor weather conditions during the Summer. The Commercial is best suited to localities where the honey crop is above average. In addition to the brood box, varroa screen floor, crown board, queen excluder and roof you should make provision for three supers per hive. It is usually best to treat exterior surfaces with a good preservative, like Cuprinol – green or Fencelife and taking care to air well for a week or more. Normal paint stops the wood ‘breathing’ and can lead to moisture lifting the paint in bubbles. By the Spring you will have a good background of knowledge to help you decide on what to buy and how to start up. It is essential that you start with a healthy and productive stock of bees. You should contact a reputable beekeeper in your region for assistance in obtaining your first colony. While it is also possible to start by obtaining a swarm, this is an unreliable method and you have no assurance of the health status of the resulting colony. You may be tempted to buy a strong colony in the hope of a quick return of honey this Summer, but sometimes the difficulty of handling a large stock as a beginner can put a newcomer off for life. It is far better to arrange with a local beekeeper to buy a four-frame nucleus with a young queen, taking delivery at the end of May or early in June. This is also the time when outdoor open hive demonstrations are organised by your Association where you can learn how to handle and control a stock of bees. You can now expand this newly acquired nucleus by regular feeding with sugar syrup into a full hive of eleven frames by July. They will be very quiet and easy to handle and as they grow in strength you will gain in experience, confidence and the necessary manual skills of beekeeping. By the following Spring you will be well placed to increase to two stocks by making an artificial swarm from your own hive in May. If you have built or acquired a couple of empty hives over the Winter you will also be ready to take or buy in swarms sometime in May or June, and by July you will have at least three good stocks and the experience necessary to manage them. You should also have a crop of honey and an opportunity to learn the techniques involved in taking it off, extracting, bottling and preparing it for sale. It will still only be fifteen months since you first owned bees but you have come a long way, and it might be wise to stay with just two or three hives for another year. It is much better to make your mistakes on two or three hives than on twenty. Possibly three hives are all you intend to have anyway. In either case, make a four frame nucleus from your strongest stock some time in the Summer and see it through the Winter to sell to another beginner, to increase you own stocks or as a reserve in case anything goes wrong. Honey yield is greatly influenced by seasonality. However a beekeeper who attends to the basic principles of management should be able to achieve an average of 20kg per hive per annum. 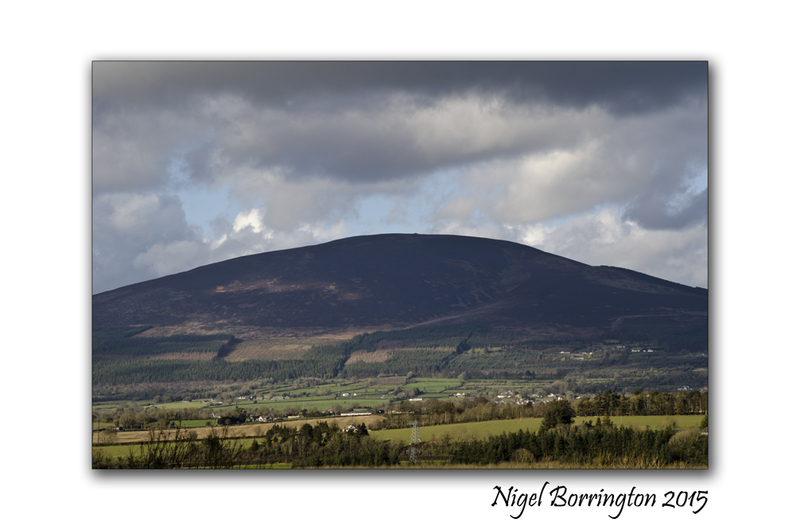 The yields obtained at the Teagasc Beekeeping Research Station at Clonroche, County Wexford confirm this view. The yield from 75 colonies managed commercially at Clonroche has been 25 kg per colony per annum. This has been achieved by working to a planned programme of management and disease control. Where can I keep my bees? The newcomer to the craft of beekeeping must decide where to site his or her apiary. Even a small garden is adequate for the keeping of a few hives. Bees fly anything up to three miles to forage so you have no need to worry about that. Even the largest beehive will measure about two feet square and that is all that is needed for each hive, but don’t forget to add a little space to stand along side it to work the colony. You might like your honeybees but it is unlikely that your neighbour will display the same enthusiasm. Bees have no need to disturb others, whether human or animals, it is just a case of ensuring that their flight paths to and from the hive do not coincide with neighbours working in their gardens. Hives standing in full sun should be avoided, try to provide some midday shade. Some say that entrances should face south-east to catch the early morning sun. The best layout is to have a hive facing each of the four cardinal points of the compass-one facing north, one facing south etc. This does help to prevent bees drifting from their own hive into another. Some beekeepers have an out-apiary away from their home and your local Association will have a demonstration apiary for the members to use. How much time do I need to devote to the bees? We usually regard the period from October to March as the ‘off-season’ so far as opening up hives, lifting out frames and manipulations generally are concerned, but a limited inspection on a mild day in March can be justified on the grounds that we can only help our bees if we know what help they need. Just three questions have to be answered at this time of year. Have they a laying queen? In some cases the answer may be obvious; for example if the bees are flying freely around midday and taking in massive loads of pollen, then all is well with the queen. Have they enough food? If the hive still feels really heavy when hefted, they have enough food. Possibly about 1 hive in 3 will either feel light, or show little flying activity with not much pollen going in, and in these cases some action is required. What is the natural varroa mite mortality per day? If this figure exceeds seven mites per day then control is necessary using one of the approved treatments. Check the updated F.I.B.K.A. policy on varroa for details. You have to continue with your colony inspections right through the Summer. So the time you need to devote to your bees could be as little as 15 minutes per hive every 10-14 days during the season from April to September. Usually the problem is that new beekeepers are unable to leave the bees alone for the first season.